Hampshire House welcomes the renewing, revitalizing days of the brighter half of the year with our spring/summer menu items that represent the very best of the season. Incorporating seasonal ingredients into your spring event will enhance the uniqueness and enjoyment of your special occasion, honoring the first blooms. These special dishes, created by our award-winning chefs, feature such spring favorites such as asparagus, English pea, Chantenay carrots and fava beans, in elegant and delicious presentations. Asparagus, English Pea and Fava Bean Soup is served with a mint-cream fraiche, and our Fried Wellfleet Oysters are prepared with smoked salmon remoulade. You’ll also find beloved summer staples in refreshing pairings like shrimp and avocado, watermelon and feta, and chicken brochettes with yogurt sauce or Asian spices and curry sauce. 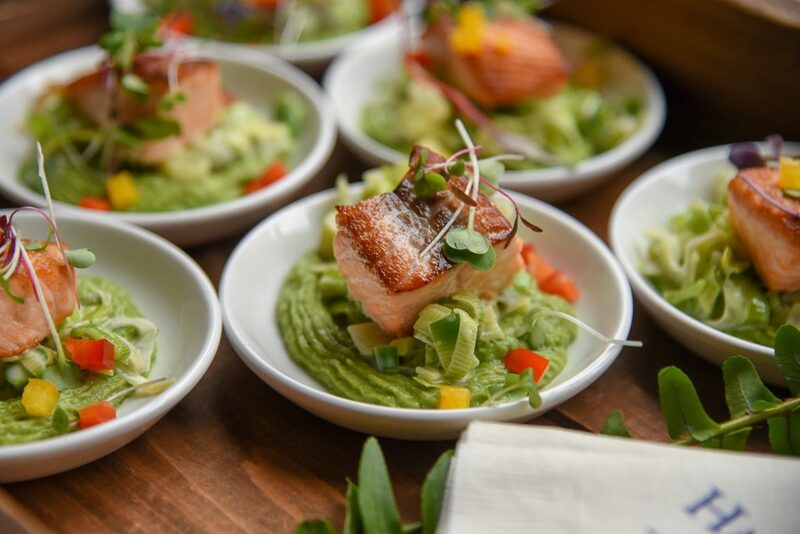 Sweet Pea Ravioli, Beef Tenderloin with Chimichurri, and Grilled Salmon with fava beans, asparagus, leeks, and mint pea puree are miniature appetizers that will thrill the senses. Our specialty stations, prepared by an in-house chef in your private room, have also been designed to highlight seasonal ingredients. There’s our tapas bar featuring many delights such as serrano ham crostini with Manchego cheese and quince paste, shrimp a la plancha with saffron aioli, and crab meat stuffed calamari. Our traditional New England Clam Bake includes lobster, steamers, PEI mussels, BBQ chicken breasts, and all the expected accompaniments. The La Taqueria Station lets you and your guests create gourmet tacos. Pastry Chef Atelier will satisfy the most discriminating sweet tooth, with the opportunity to design your own delicious indulgence. Choose from starters like miniature vanilla cannoli shells, lemon scones, and chocolate whoopie pies; dessert fillings such as chocolate mousse, mango sorbet, and seasonal berries; and garnish it with toppings like Chantilly cream, slivered almonds, and berry puree. Enhancements include petit fours and miniature pastries, lemon squares, and crème brûlée. Begin with our spring-inspired asparagus, English pea and fava bean soup, potato leek crostata, or spring vegetable risotto. Our exquisite 2019 Spring/Summer Plated Dinners brings together the finest entrees – Roasted Halibut, Chicken Supreme, Lamb Rack, or Fricassee of Lobster – with perfectly complementing appetizers, salads, and desserts, for an elegantly prepared feast that’s bursting with the fresh, exciting flavors of the season. Choose from fresh and imaginative salads, and finish with the sweet satisfaction of peach melba, strawberry vanilla rhubarb tart, lemon meringue tart, or chocolate raspberry mousse. Enhance the Atmosphere with Spring Florals! As you choose the menu for your spring event, consider adding spring-inspired floral arrangements to your tables to celebrate the beauty of the season. Flowers that bloom in the spring include tulips, peony, hyacinth, daffodils, azalea, bluebell, crocus, lilac, primrose, pansy iris, allium, snowdrops, freesia, and anemones. In addition to a glorious rainbow of colors and scents, each brings its own significance and symbolism. 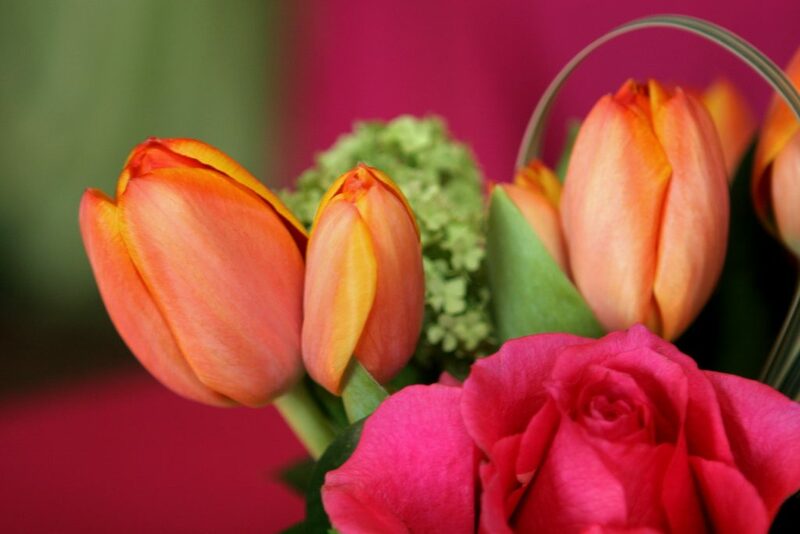 Tulips signify happiness, good wishes, attachment to another person, and perfect love, making them great for an engagement party. The peony, which is native to China, symbolizes prosperity, honor, a happy marriage, good fortune, and compassion. The daffodil is the flower of rebirth and new beginnings. Pansies symbolize love, admiration, and remembrance, while the lilac signifies confidence and renewal, and are often associated with graduation ceremonies. If you have any questions or would like assistance in planning your special event, please contact our event professionals at Hampshire House by calling 617-227-9600 or email events@hampshirehouse.com.